Promoted by the Ponta Delgada Public Library and Regional Archive and the Green Gardens – Azores project, the exhibition Plants and Gardens: The Passion for Ornamental Horticulture on the Island of São Miguel opened on February 22 at 6:00 PM. The catalog is now available to the public. 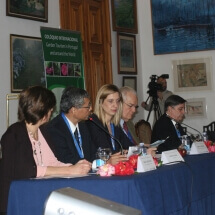 The application to support the visit to a group of Azorean gardens, will be available to the public free of charge from the next day April 22, 2019. The "Green Gardens – Azores" project aims to contribute to the recognition of the historic gardens of the Azores as quality tourism assets associated with nature, culture and wellness, through the discussion and implementation of garden tourism. This project is integrated in the strategic framework "Plan of Action for the Development of Tourism in Portugal 2014-2020"
The gardens of the Azores are of significant heritage value, in terms of their history, botany and landscape. 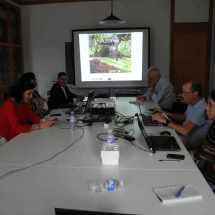 The aim of the project is the scientific and technological consolidation of “Garden Tourism” in the Azores, regarding its historic gardens as a specific tourist product with great potential to promote the destination. It raises research issues, such as, the assessment of the environmental, the patrimonial and aesthetic quality of the gardens, based on the findings in various subject areas; the correlations to be established between the vision of the experts and user experiences; and also the most effective communication strategies and mechanisms. It includes a triple component of research, training and the creation of an application for mobile devices and a GreenGA webpage. The scientific results and indicators include the organisation of international workshops and seminars, scientific publications and three informative brochures on the public gardens of São Miguel, Terceira and Faial. It should be pointed out that this project was integrated in the Portuguese tourist board’s strategic framework «Plano de Ação para o Desenvolvimento do Turismo em Portugal 2014-2020» [«Plan of Action for the Development of Tourism in Portugal 2014-2020»]. 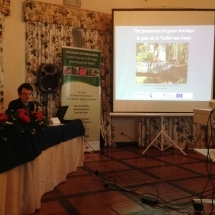 I. S. Albergaria, J. Mora Porteiro, M.J. Trota, A.M. Arroz, R. Gabriel, C. Santos, «Historic Gardens of the Azores as a tourist attraction of the archipelago: a survey carried out by the European Founding research project “Green Gardens – Azores (GreenGA)». Oral presentation to the International Congress on Culture, Sustainability and Place: Innovative approaches for Tourism Development, Universidade dos Açores, CES/Thompson River University/OTA/UAc. I. S. Albergaria, "Historical Gardens of the Azores through the lens of sustainable tourism: contributions of the green gardens project - Azores (greenga)", in the 12th meeting for the conservation of the Azores bullfinch. Biodiversity. Conservation, sustainability. Organization: the priolo's Environmental Center spea, and the land of priolo, auditorium of the public library and archive of Ponta Delgada. Paz, Eduarda & Albergaria, I.S., «Camellia collections in the Azores islands: perspectives on the study, conservation and promotion of their value for cultural tourism», paper given at the International Congress ICS Nantes 2018, Cité Nantes Events Center. Pérez Santa-Rita, J.V., Ros-Prieto, A., Vieira, V., Karsholt, O., Gabriel, R. & Borges, P.A.V. (2018). New records of moths (Insecta, Lepidoptera) from urban gardens on Terceira Island with new data on recently introduced species to the Azores. Arquipelago Life and Marine Sciences, 35: 47-65. J.Porteiro & I. Soares Albergaria - "The cultural dimension of the Azores landscapes. 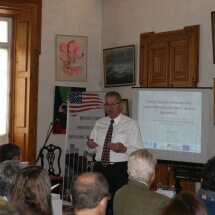 The contribution of historic gardens for sustainable tourism in the region." In Ramon Garcia Marin; Francisco Alonso Sarria; Belmonte Serrato Francisco; Daniel Muñoz Moreno (Eds. ), XV Colloquium Iberian Geography 2016. Proceedings [CD-ROM]. Asociación geographers Españoles, pp.656-664. ISBN 978-84-944193-4-8. I. Soares de Albergaria - "Hand in hand with the magic of nature," My Plan Magazine, No. 5, January-January / Feb-March, 2017, pp.34-35. M. J. Pereira - "Flora in the José do Canto Woodland Garden", My Plan Magazine, no. 5, January - January/February-February, 2017, pp. 36-37. I. Soares de Albergaria-«Camellias or Japonese Roses», My Plan Magazine, no. 7, May-June/May-June, 2017, pp. 44-46. 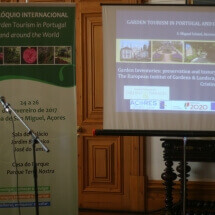 Garden tourism in Madeira and the Azores: from its historical dimension to current scenario", paper presented at the VI Conference of Velas, Açores e Madeira: Percursos de Memória e Identidade. Coord. A. Vieira and D.N. Chaves. Santa Casa da Misericórdia of Velas, 2017, pp. 187-207. A datasheet has been prepared that will serve to gather information on each garden, in conjunction with other inventories of already tested gardens and the database. 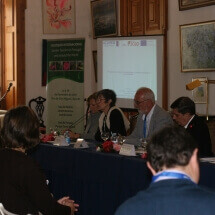 With reference to the European Landscape Convention (20 October 2000), the Observatory for Tourism in the Azores (OTA), the Institut Européen des Jardins & Paysages (IEJ & P) and the Maison de la Recherche en Sciences Humaines de Caen (MRSH) have signed a cooperation protocol aimed at building a European database of gardens. This initiative seeks to encourage exchanges among experts on a multidisciplinary basis that crosses environmental sciences, humanities and the arts with information and communication technologies (ICT). M.J. Trota (advisor) e I. Soares Albergaria (member) of the master's degree thesis of Cátia Faria Freitas entitled "The Ex Situ Conservation of the Azores Native Plants in the Botanic Garden of Faial". Master's degree in Pre-School Education and 1st Cycle Teaching by Ana Sofía Mendes Ribeiro Ferreira Simões, entitled "Opportunities for contact with nature in the city: practices of citizenship in pre-school education and in the 1st cycle of Basic Education." M. J. Pereira (advisor) of the ERASMUS student stage Júlia Albert Varela, School year 2016/2017. Phenological record, herborization, collection of images and description of the floristic cast of Jardim José do Canto. M. J. Pereira (advisor) and I. S. Albergaria (member) of the jury of the defense of final project of student Ana Silva for the class "Project", within the degree of Biology. The project was entitled "Phenological, herborization and collection record and pictures and description of the floristic cast of Jardim do Palácio de Sant’Ana. Hiring of a nature conservation technician and master in environmental sciences for the research project Green Gardens Azores. The main activity carried out by the contractor is to support the implementation of scientific tasks as well as contribute to other activities within the overall objectives of the project. Two interns from the Erasmus Program and one biology student from the University of the Azores were hired. 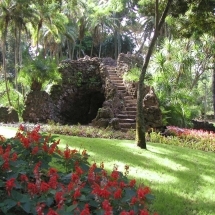 Main purpose: to contribute to the promotion of the historic gardens of the Azores as a quality tourism asset associated with nature, culture and welfare through conceptualization and development of garden tourism (TJ). This will include: 1. Producing content for visitors based on multi-disciplinary scientific research; 2. Design and implementation of communication and promotion strategies, giving priority to ICT, namely through the establishment of a mobile application; 3. Design and test market strategies tailored to different user profiles, with a view to create a brand that makes the economic exporation and cultural management of the gardens of the Azores; 4. 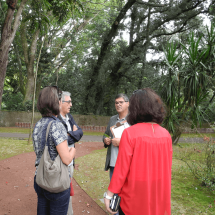 To foster the transfer of knowledge among researchers, managers, curators, owners and potential users of the gardens, in order to support strategic decisions leading to the conservation and development of historic gardens of the Azores. RESULTADOS:	Implementação de networking entre parceiros locais, nacionais e internacionais; Criação de uma App, webpage e outros dispositivos destinados a visitas autónomas aos jardins; Publicação de 3 obras de divulgação científica; Participação em eventos científicos nacionais e internacionais com vista à divulgação dos resultados científicos do projeto; Realização de ações promocionais do produto "Jardins Históricos dos Açores"
Roundtable– Historical Gardens of the Azores - What future? © 2019 OTA. ALL RIGHTS RESERVED.